Instead of “cyclists,” people biking. Instead of “accident,” collision. Instead of “cycle track,” protected bike lane. It can come off as trivial word policing. But if you want proof that language shapes thoughts, look no further than Seattle — where one of the country’s biggest bikelashes has turned decisively around in the last four years. For a while in 2010 and 2011, the three-word phrase “war on cars,” which had risen to prominence in Rob Ford’s Toronto and spread to Seattle in 2009, threatened to poison every conversation about improving bicycling in the city. Eleven characters long and poetic in its simplicity, the phrase could pop easily into any headline or news spot about transportation changes. Today, the phrase seems to have receded from Seattle’s public life. And now the pro-bike, pro-transit policies championed by former Mayor Mike McGinn and continued by his successor Ed Murray are bearing fruit. The city has lined up one of the most ambitious protected bike lane building schedules in the country. A public bike sharing system launched last fall. Jobs and residential construction are booming along Seattle’s new streetcar line. No major city in the country is growing faster. This week, Seattle’s KING-TV devoted three minutes to a triumphant catalog of the city’s transportation accomplishments: falling congestion, rising bus frequencies, 20 miles of new bike lanes and paths this year. Though there were many forces behind the turn of Seattle’s tide — the “war on cars” phrase in particular faded after McGinn lost his reelection bid in 2013 — no single organization has more to do with the city’s new language than a tiny nonprofit group called Seattle Neighborhood Greenways. 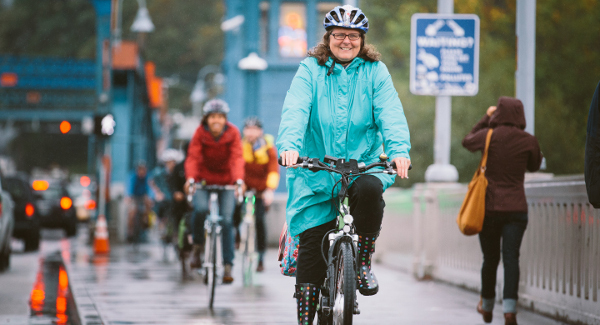 Cathy Tuttle of Seattle Neighborhood Greenways on the Fremont Bridge in 2014. SNG was founded in 2011, the year the “war on cars” meme peaked. Their goal: to advocate for a citywide network of low-traffic local streets, modeled on similar systems in Vancouver and Portland, that could be optimized for biking, walking and running. Though the group made no secret of their biking advocacy, they didn’t brand themselves as biking advocates. They branded themselves as neighborhood advocates. Executive Director Cathy Tuttle, unable to manage every project citywide, deputized advocates around the city to speak as “Fremont Greenways,” “Kirkland Greenways,” and so on. Together, the groups fought bad language with good language. Instead of “bikers” or “cyclists,” they said people biking; instead of “drivers” or “cars,” they said people driving. “Cycle track,” an engineering term translated from Dutch, became the more intuitive protected bike lane. Instead of “accident,” which implied that conscious choices like speeding aren’t involved in traffic collisions, the group simply called them collisions. 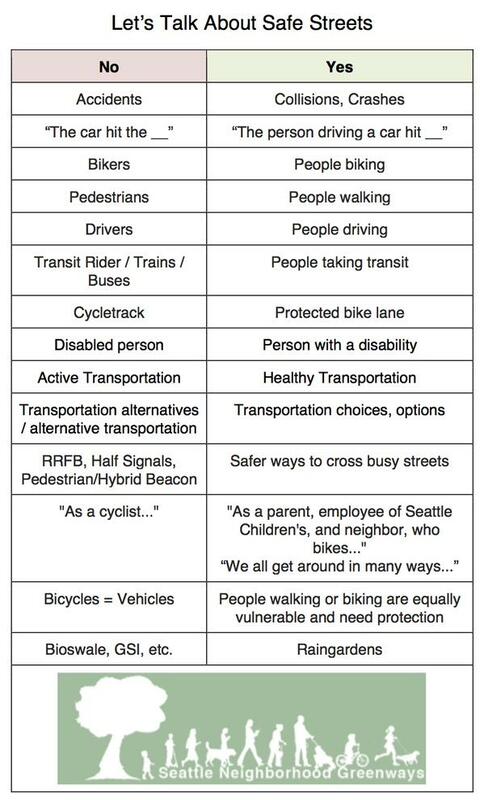 Seattle Neighborhood Greenways’ cheat sheet for neighborhood advocates and city officials. “When you start thinking of somebody as a ‘driver’ or somebody as a ‘cyclist’ or somebody as a ‘pedestrian’ — which is actually my least favorite — it’s easy to think of someone as part of a tribe,” said Fucoloro. Seattle Neighborhood Greenways broke down that tribalism by convincing advocates around the city to talk about “bicycling,” an activity, rather than “bicyclists,” an identity. Jennifer Langston, a researcher for Seattle’s Sightline Institute who has studied the greenways movement, said the shared language complemented Seattle Neighborhood Greenways’ decentralized approach to advocacy. Seattle Neighborhood Greenways didn’t invent these ideas, Fucoloro said; it watched them develop in Portland and elsewhere and imported them to Seattle. And the group hasn’t been alone in its work. The much older and larger Cascade Bicycle Club has also shifted its language, as has the City of Seattle itself. Fucoloro said that Cascade once tended to describe anything that improved bicycling as a “bicycle project,” unintentionally implying that if you weren’t a bike commuter, you wouldn’t benefit. Fucoloro thinks Seattle is better, too, for having had this linguistic fight. “Even though when you’re in the middle of it, it’s the most frustrating thing in the world,” Fucoloro added.